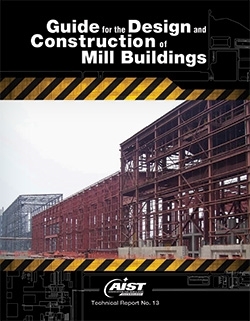 This report guides the owner and designer through the many assumptions and parameters involved in the design of a mill building. It suggests loads and load combinations for the design of crane runways, roof structures, floors, columns, building frames and foundations. Information is given for investigation, earthwork and excavation requirements as in the 1997 edition, as well as revisions to vibration, foundation, soil bearing foundation, crane rails and crane rail splices. In the 2003 edition, all information has been reviewed and updated to the current state-of-the-art procedures for design. However, latitude has been provided for even more advanced proven techniques. All information and direction is within the requirements of national codes and specifications. A listing of many references (also revised) is provided.